“8). Do you support a carbon tax? Do you support the Obama administration’s use of the social cost of carbon in rulemakings? 9). Do you think federal agencies have abused the cost-benefit process to suit their political agenda? Would your administration end the process of underestimating costs and inflating benefits of agency regulations? President candidate Donald Trump responded to ten questions submitted by the free-market energy advocacy group, American Energy Alliance (the advocacy arm of the Institute for Energy Research, of which I am founder and CEO). Overall, there is great promise of market-oriented reform, reinforcing Trump’s earlier statements about reigning in the US Environmental Protection Agency (EPA). Trump is weak on ethanol mandates and pretty good on most other issues. A particularly weak sentence is: “Until this nation sets its sights on total energy independence, we must support all energy sources.” The terms ‘energy independence’ and ‘energy security’ were nebulous, statist terms in the old days. As most people are, I too am subjected daily to the mass media reports that broadcast the need for building renewable, clean energy sources. 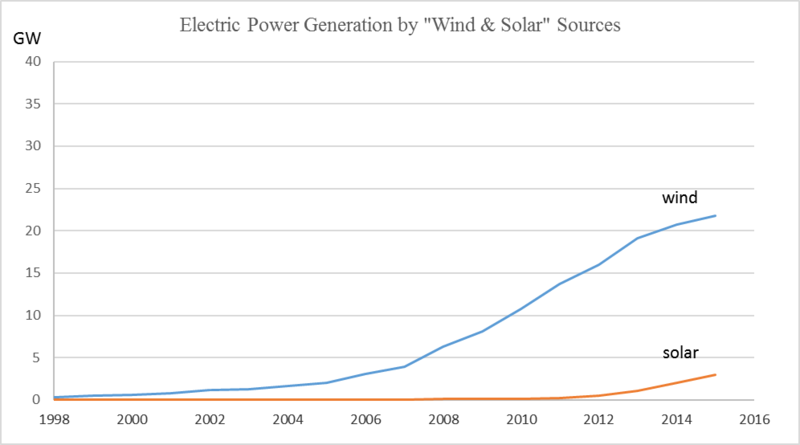 Those sources are usually identified as “wind, solar and others” followed by a hint at their rapidly increasing output. 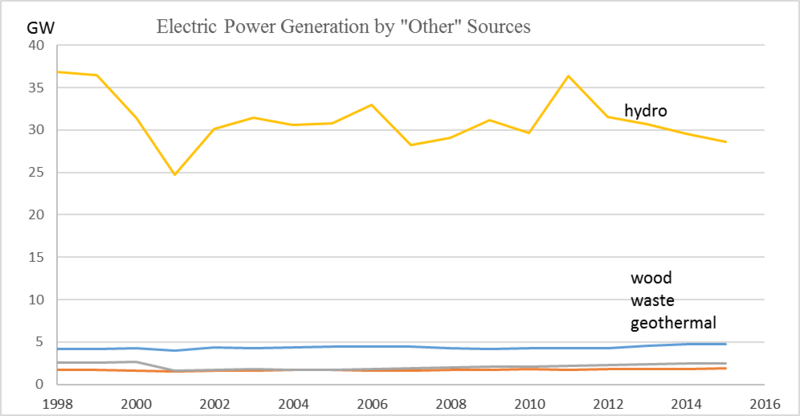 Looking at the four sources in the upper graph, hydro, wood, waste and geothermal, there has not been a worthwhile upward trend in any of them for two decades. Most states use a future “test year” where the utility estimates its revenue and costs for an upcoming period. Naturally, the utility will ‘low ball’ the projected revenue to justify asking for a higher level of revenue through individual rates approved by the regulators. Similarly, costs in the model year will be overstated as much as the utility thinks it can get away with.